For the last six months, a coordinated dialog has been taking place among a number of the key worker cooperative development and networking organizations in the Bay Area community, a collective initiative to lift the movement onto a higher scale, and make a truly significant regional impact. 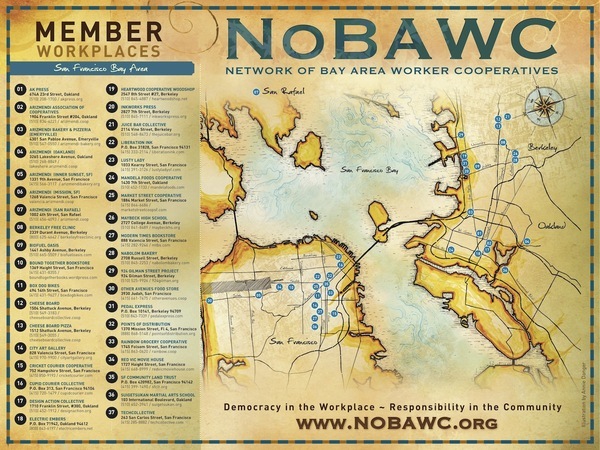 The Network of Bay Area Worker Cooperatives (NoBAWC) has been a participant in this process. For decades the Bay Area has been an extremely active region for cooperative and solidarity organizations. In some ways, so much is happening here, with so many players today, that it is hard to keep an adequate handle on it all. Today’s current discussions are attempting to deal, on a higher level, with the same issues that led to the creation of NoBAWC twenty-one years ago. Today NoBAWC is comprised of over 36 democratic workplaces including small and medium-sized workplaces employing from a few to over 250 workers, representing diverse industries and economic sectors, with a combined annual sales of over $80 million, and around 1,000 workers. In 1994, a time when there already were a good number of collective and cooperative groups in the Bay Area, but very little interaction among them, nine democratic workplaces met to address this isolation and build a regional worker cooperative movement. They founded NoBAWC for that purpose. For the first eight years NoBAWC was an informal association, highly participatory, member-driven, run entirely by volunteers, with no budget. NoBAWC’s decision-making structure was by simple consensus. Membership consisted of all democratic workplaces which agreed with the principles of NoBAWC and considered themselves members; there were no membership dues. Gradually NoBAWC clarified our mission as furnishing support for our member workplaces; providing consultation and referrals for people interested in starting democratic workplaces; promoting them in the community as sources of meaningful employment, providers of quality goods and services, and as viable alternatives to the dominant forms of ownership and management of workplaces. Between late 2001 and mid-2004, NoBAWC transitioned toward a more formal structure. The informal structure had made it impossible to respond to many requests for assistance from individuals and workplaces, unable to execute many desired projects, and incapable of meeting many of our stated goals and mission. NoBAWC elected a Steering Committee, began fundraising, and hired a part-time staff person. In 2005 we replaced the Steering Committee with an elected of Board of Directors, empowered to oversee staff and continue the organizational progress. We clarified our committee system and adopted committee guidelines, empowering individuals from NoBAWC member workplaces to work on specific projects while providing a framework for committee accountability to the general membership. We started membership dues. Groups not able to pay dues could usually work out barter or other arrangements. Dues provided a small, but reliable, revenue stream which financially stabilized NoBAWC so we could budget operating expenses and continue to develop. Membership stabilized at between 35-40 groups. While for several years the focus had been on internal structure, we now moved toward a more outward focus, promoting workplace democracy in society. In 2005, we held a major week-long worker cooperative conference and film festival, attended by over 300 people. The following year, member participation grew through committees: Outreach, Website Development, Dues, Marketing, and Newsletter. In 2006 we held “roundtable” forums on topics such as Worker Cooperative Development in the Bay Area; and Sustainability & Worker Cooperatives. NoBAWC joined the recently-formed U.S. Federation of Worker Cooperatives (USFWC) and participated in the 2nd USFWC Conference in New York. It was during this period that we started to make contact with other regional worker cooperative organizations that were forming. In 2007 we attained legal status as a non tax-exempt unincorporated association, organized another successful conference, continued roundtable discussions, and sent representatives to the Eastern Conference for Workplace Democracy in July and the Western Worker Cooperative Conference in October. We continued to serve as a community resource for those interested in workplace democracy by offering assistance, referrals and information at no charge. We regularly talked with start-ups, worker cooperative developers, and to people interested in converting workplaces into worker cooperatives. We consulted with workplace democracy researchers and activists, including individuals organizing a worker cooperative credit union, others developing legislation to codify worker coops into California law, and an organization writing a feasibility study on developing a worker cooperative equity fund. We published a Coop Map/Poster, to serve for marketing and to promote worker coops in our community. We organized public forums, spoke in classrooms about worker cooperatives, and tabled at community events. We shared our staff-related documents with other regional worker cooperative organizations, and sent representatives to the U.S. Federation of Worker Cooperatives conference in New Orleans. The late 2008 collapse of the national economy into the Great Recession resulted in a surge of interest in worker cooperatives as an alternative means of economic development. High unemployment and the later Occupy movement relaunched an intense national debate over economic inequality and the future of capitalism. Occupy’s use of participatory democratic structures and its search for a just way to organize the economy dovetailed with worker cooperatives. Today in 2015 NoBAWC is no longer working almost alone, trying to do and be everything. The Bay Area is home to many organizations organizing the worker cooperative/solidarity movement. Yet today most people in NoBAWC and many other active Bay Area organizations still feel that the movement as a whole has not been achieving our full potential of making a social impact on a significant enough scale. Groups continue to do overlapping and conflicting work, act separately, often do not share important information. In the absence of a clear systemic analysis and a coordinated regional concept and plan, each group has struggled to find the roles that it could play best in the system. By lacking a clear analysis of systemic gaps and needs, organizations have not been able to step up and fill those gaps. But because we share common goals, we are now trying to work more closely together to move beyond these limitations. NoBAWC is no longer working almost alone...The Bay Area is home to many organizations organizing the worker cooperative/solidarity movement. A successful example of how a related movement has used a similar process to connect itself together on a large systemic scale in many regions, is the Food Hub movement. Food Hubs are becoming a key element in developing viable local and regional food systems and to stimulating new economic opportunities within those networks. Food Hubs spring primarily from local initiatives, but government resources are also being made available to many of them. Even the US Department of Agriculture is involved and considers assistance to Food Hubs a priority. The Advisory Council to the California Network of Regional Food Hubs defines a Food Hub as “an integrated food distribution system that coordinates agricultural production and the aggregation, storage, processing, distribution, and marketing of locally or regionally produced food products.” To small farmers in most areas, aggregation and marketing are usually the primary missing elements in the chain. Food Hubs are systems, with iterations in numerous places around the country, organized by filling in the gaps between existing components. They have been set up by a flexible combination of cooperatives, social enterprises, nonprofits, and social entrepreneurs, sometimes with the assistance of government agencies. One of many successful examples is the Vermont Farm to Plate Initiative. In our Bay Area systemic initiative, some of the groups and organizations involved, to varying degrees, besides NoBAWC, are Project Equity, US Federation of Worker Cooperatives, Democracy at Work Institute, Sustainable Economies Law Center, East Bay Community Law Center, Richmond Worker Cooperative Revolving Loan Fund, The Artisan Hub (Richmond), Prospera, Rainbow Cooperative Grocery, Poder (SF), and the Arizmendi Association. The focus of our meetings has been an analysis of all the factors involved in creating a successful system: strengths and weaknesses, assets and deficiencies, what we have and what we need, supply and demand, the existing components/elements and the gaps. The goal is to create the links, connect the dots, bring people together, facilitate areas of problematic interactions, correct unproductive duplication, attune roles to the best fits, create the missing parts of the puzzles, empower all productive people in the process, and move toward implementing a cooperative/solidarity system on a truly impactive scale. NoBAWC has always been a flexible organization, and we are still struggling with many of the issues of how to respond to our members’ needs and build a transformative worker cooperative movement in our region, while connecting more fully with the national and global movement. In this era of deep social crises, we can play a key role in the larger movement for social and economic justice, by creating visionary yet practical ecosystems of workplace democracy. 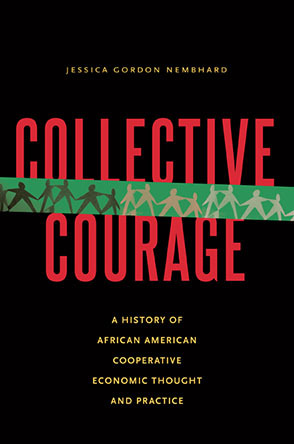 John Curl is a board member of NoBAWC, a member of Heartwood Cooperative Woodshop, and author of For All The People: Uncovering the Hidden History of Cooperation, Cooperative Movements, and Communalism in America.